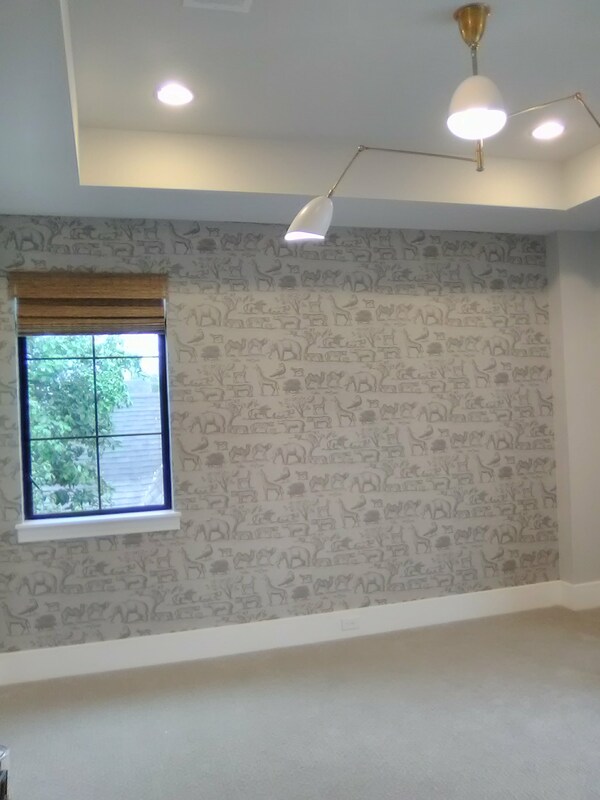 Usually, a smooth wall coated with a good quality wallpaper-specific primer is the best surface on which to hang wallpaper. 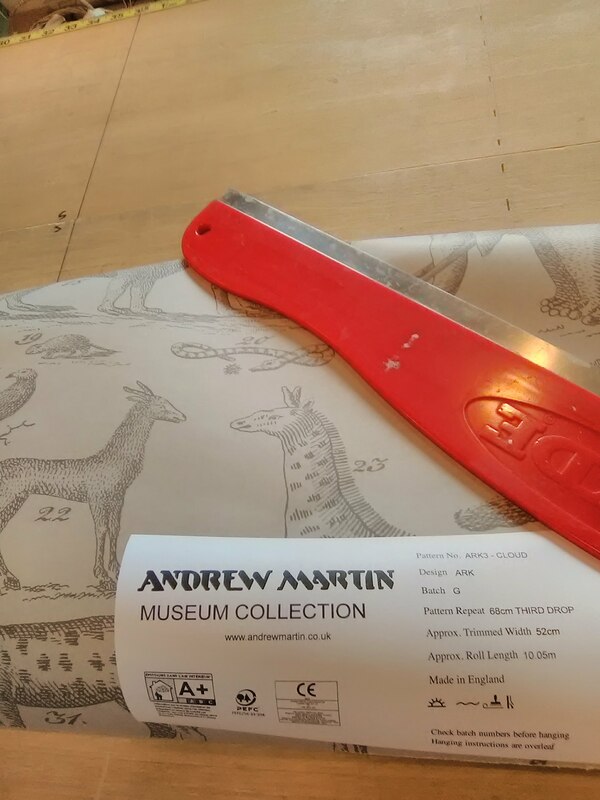 But with certain papers, particularly high-end or delicate materials, or in certain room conditions (humidity), a liner paper is called for. There are “bridging liners” which are supposed to cover cracks, gaps, bumps, ridges, and the like. In my experience, they do NOT live up to their hype. Once the paste dries, they pull tightly against the wall, and any bumps or grooves will still show. If the wall has imperfections, the best solution is to skim-float the wall and sand smooth. Hanging on liner paper is different from hanging on a primed wall. The liner grabs the paper so quickly that you don’t have the opportunity to manipulate seams or fine-tune areas that need special attention. And you won’t be able to reposition a strip even five minutes later. It does help reduce bubbles or wrinkles. A liner will increase the cost of the job, usually by more than double. There is the cost of the material itself, as well as the labor to install it. The liner has to dry overnight, so you are looking at at least one day’s additional labor, plus the cost of the liner. 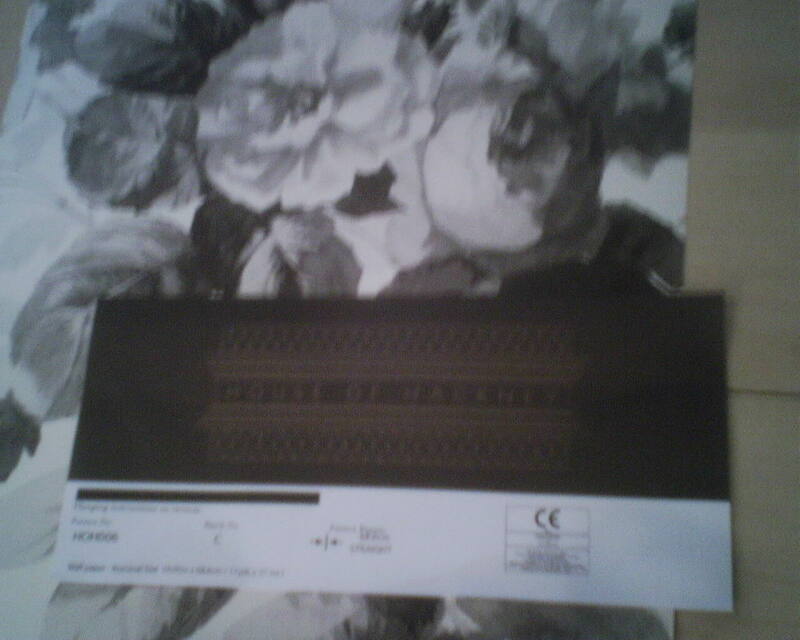 Here is a paper that has been in a master bathroom in a home in River Oaks for many years. This wall faces a wall of windows. The dark areas you see in the photo are where a piece of art was removed from the wall, and, below that, where two towels had hung on towel racks (the rods have been removed and you are looking at the support brackets). 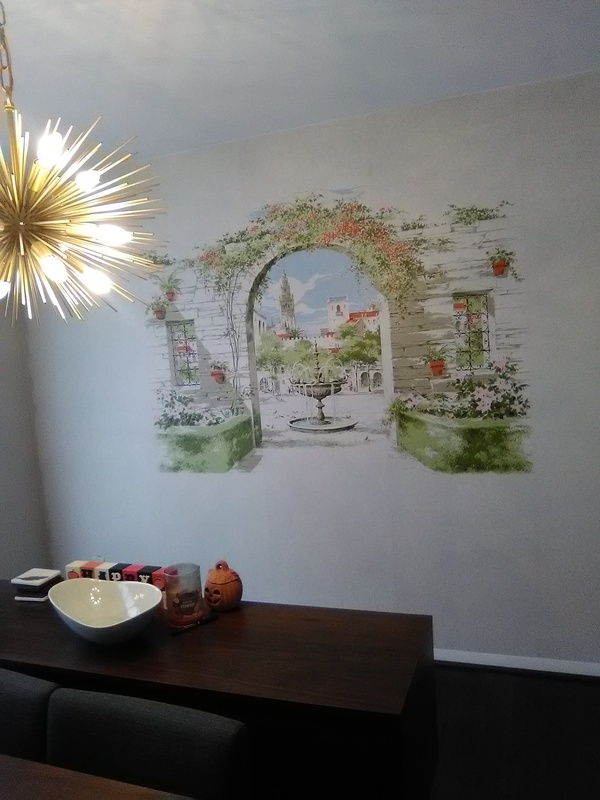 The picture and the towels kept sunlight away from the wallpaper, while the unprotected areas faded due to exposure to sunlight from the window. Some wallpapers are dubbed “fade-resistant.” This one was not. 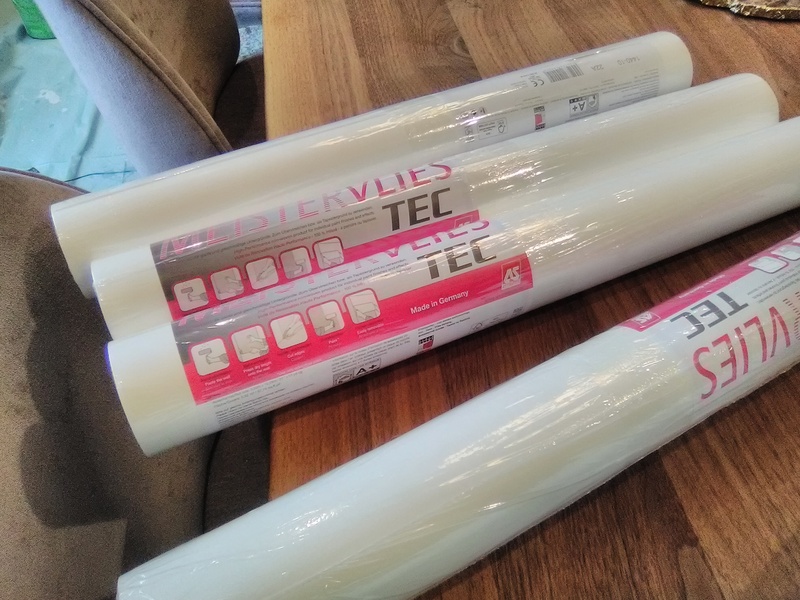 This particular brand is printed on what we call pulp stock, which is usually a British product, and the inked layer has no coating, so it is not likely to hold up well against light or water or abrading or the likes. I also think that the previous installer’s methods might have influenced the fading of the paper. The paper was hung directly on Sheetrock, with no primer. 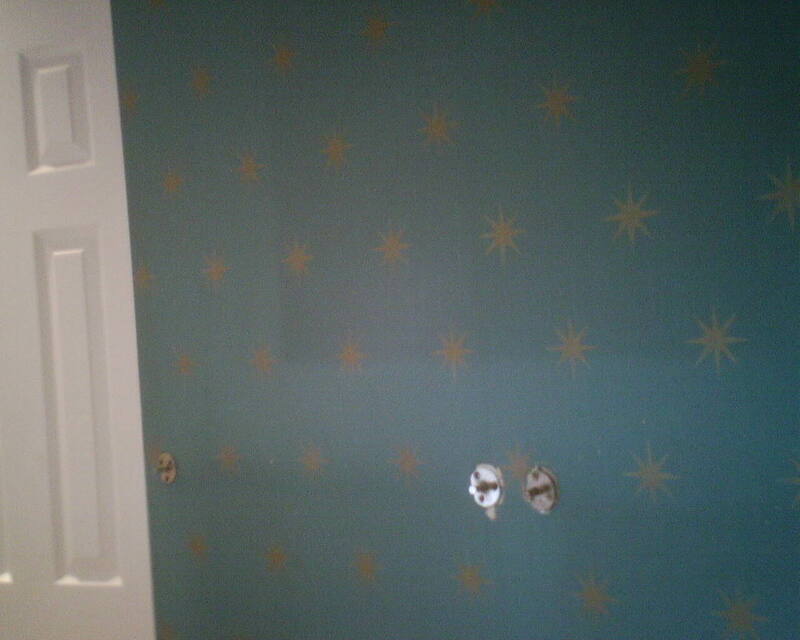 The drywall could have leeched into the wallpaper, causing discoloration. A primer would have prevented this. The installer also used clay-based paste. This stuff is really sticky, but I think it’s icky – it is slimy and hard to wipe off woodwork, and it has a tan color that I have seen work its way through wallpapers, including grasscloth, many, many times. If paste stains are bleeding through wallpaper, perhaps they are pulled more, or perhaps less, toward a source of light -and it could differ if it’s sunlight or a light bulb, too. And an obstacle such as a framed picture or a towel hanging from a bar a half an inch away from the paper block some of that light, and that could all have an effect, too. And remember that towels are often damp, and that dampness hanging next to, or even touching, the wall, could cause changes to the paper and the paste and the surface below. Just musings. 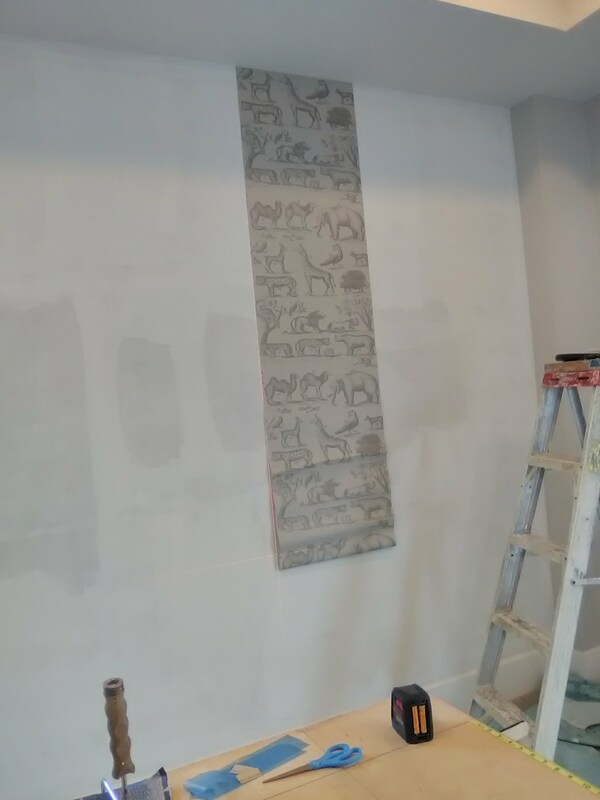 When I look at existing wallpaper, or strip off some other installer’s work, I always am fascinated by the surface, the methods, etc. Rooms for baby girls don’t have to be all about pink. 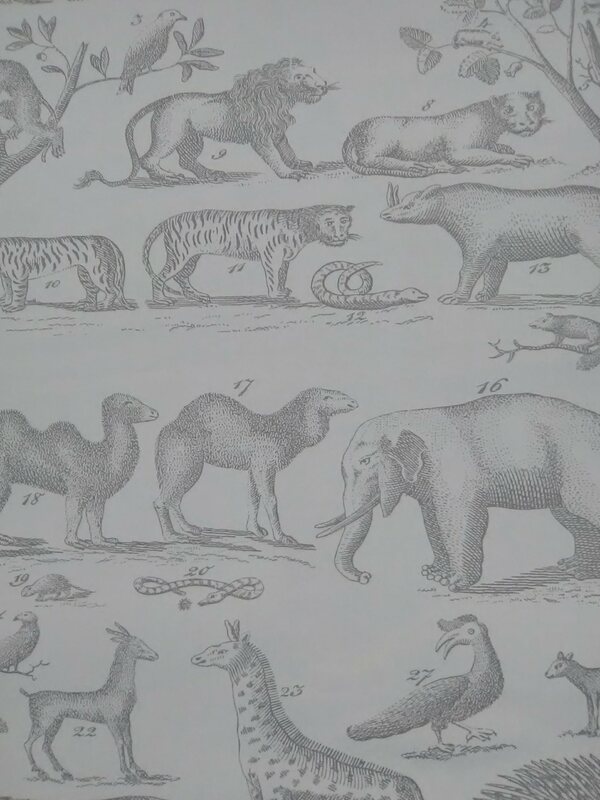 Here’s a neutral-toned, animal-rich, Noah’s Ark-themed pattern that will grow with the child. This is just one accent wall, a very effective use of pattern, and economical, too. The mother-to-be commented that the pattern was soft enough that it could go on all four walls of the room. I agreed. But I think it would look better, perhaps, if wainscoting were added at the bottom 1/3 of the wall, or a wooden chair rail and a slightly darker shade of paint at the bottom, and then have the paper on just the top 2/3 of the wall. 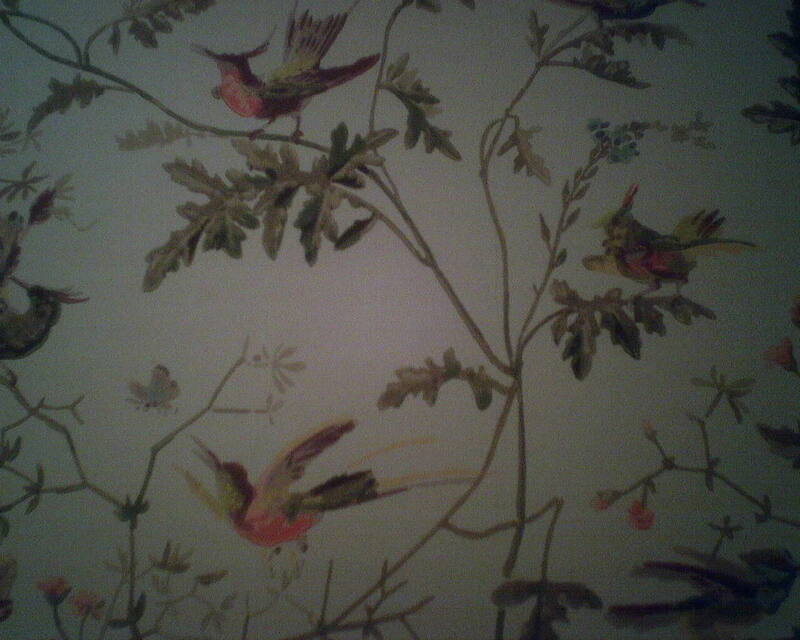 This wallpaper is by Andrew Martin, a British company, and was printed on a pulp stock substrate. It has no protective coating, so mom will have to be sure the little one keeps her hands off the paper. The home is in the Rice Village area of Houston. 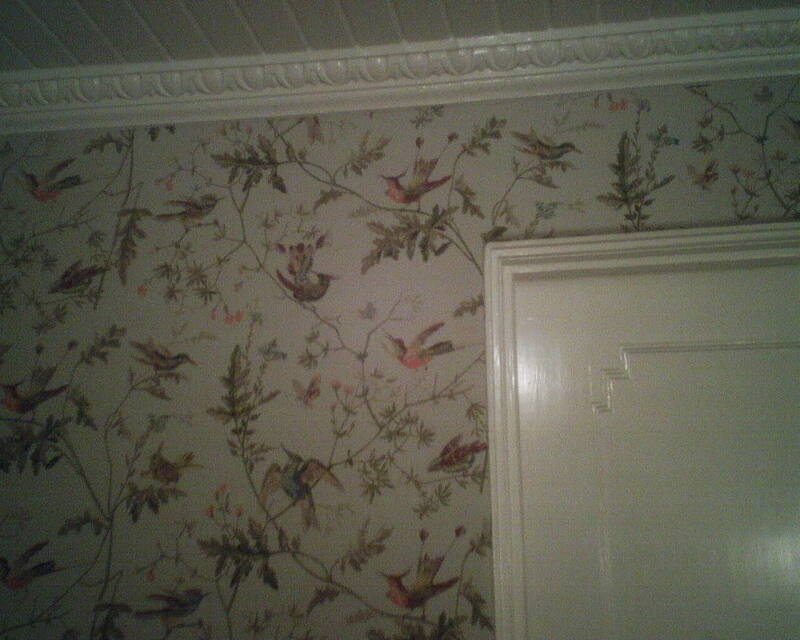 This is a good example of how wallpaper should come off the wall, when it’s been hung properly. 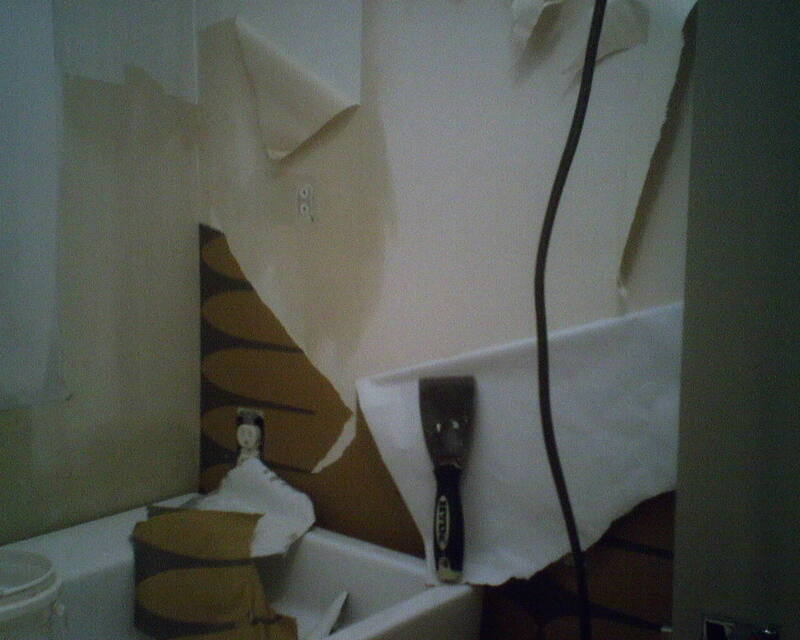 The original installer primed the walls before hanging his paper, which is a very good thing. A primer protects the walls, facilitates installation, and makes it easier to remove the paper later, with minimal damage to the wall. The brown is the original wallpaper. It is a thin layer of inked paper on what we call a pulp substrate (backing). On the right side of the photo, I have peeled away this layer. Left behind is a light tan layer of the pulp backing layer. The darker tan areas are the pulp backing that I have soaked with water. Once the water has enough time to penetrate the paper, it will reactivate the paste behind it. 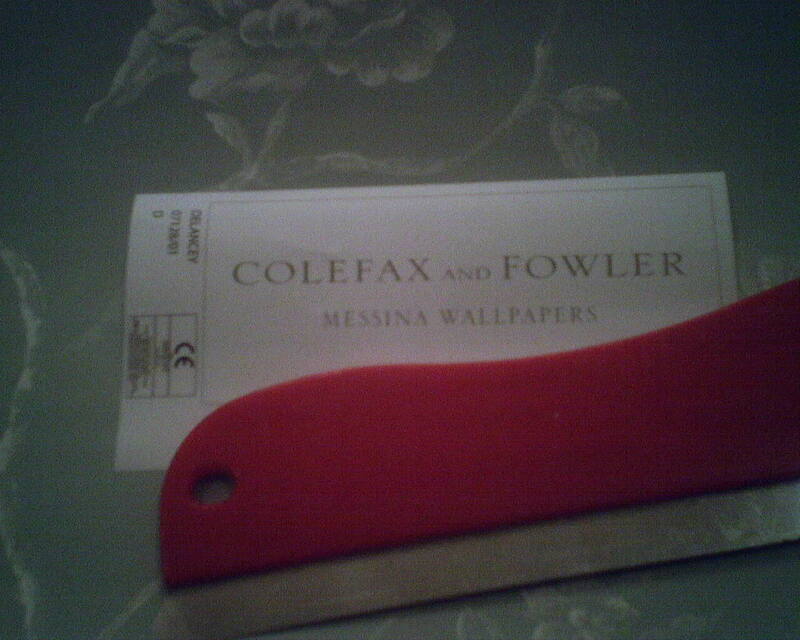 Once that adhesive gets soft, you can either scrape off the paper with a stiff putty knife (see photo), or, if you are lucky, the paper will simply peel away from the wall in large pieces. That’s what you’re seeing in the upper left of the photo. It took several hours to strip these 12 single rolls of paper off the walls of this powder room – which is reasonable and expected. 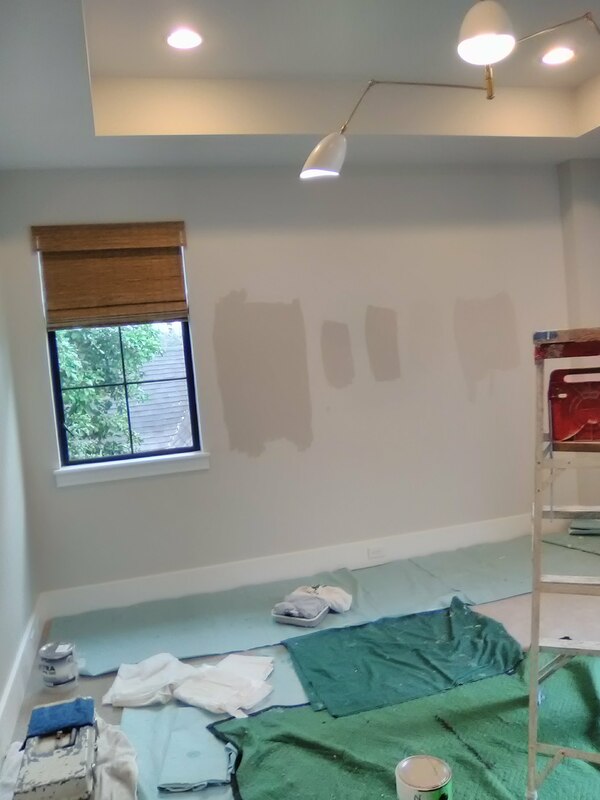 Because the original installer took the extra time and expense to coat the walls with a good primer, there was NO damage to the underlying surface. 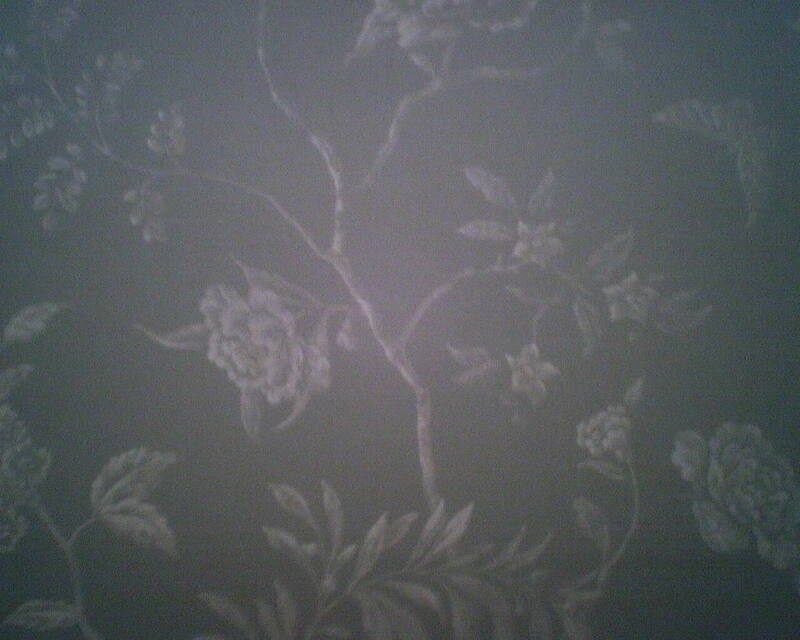 So the walls are in excellent shape and ready for new wallpaper tomorrow. A spot with this information (click link below) aired on the local news Monday, and since then it has popped up on news and information sites on the Internet. Like many such “news” stories, it is all sensation and no honest information. The article purports that “wallpaper can make you sick.” However, what it really should say is that MOLD in the air can make you sick. The article tosses out this scary claim, but makes no explanation of what kind of wallpaper might be involved, what the conditions of the room are, what connection mold has with wallpaper, how common this situation is. I will give them credit for listing a (scant) few other possible causes of mold in a building. Here are a few true facts that the reporter should have dug up and included in her story. 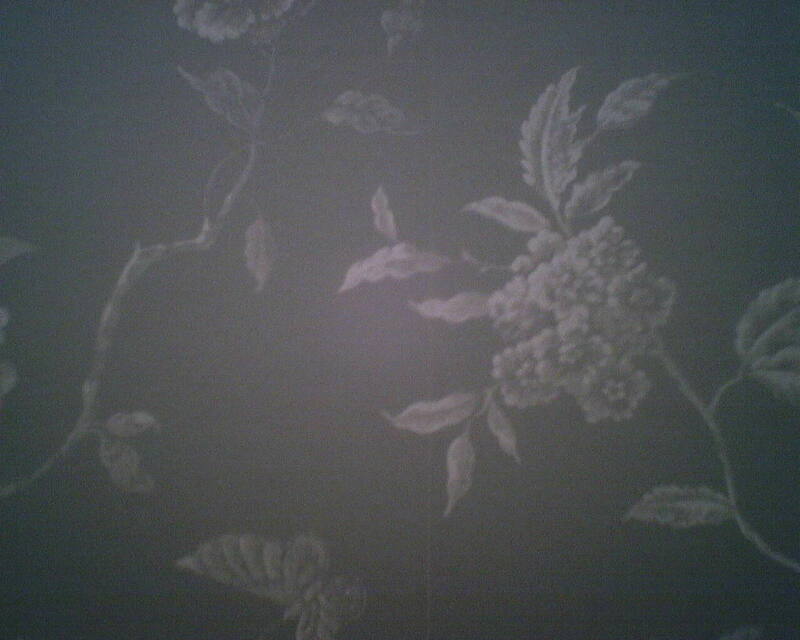 Wallpaper itself does not support the growth of mold. In fact, acrylic-coated papers, pulp papers, non-woven material, and natural fibers (grasscloth) all allow air to pass through them. Now, it is true that mold can grow behind some solid vinyl wallpapers that are commercial grade (and unlikely to be used in homes), because they don’t breathe. But conditions would have to be right for this to happen – improperly prepped walls, improperly installed wallpaper, humidity or dampness in the building, moisture inside the wall (leak in a pipe or roof), lack of air conditioning / heating, lack of air circulation or ventilation. And usually the mold just sits there. 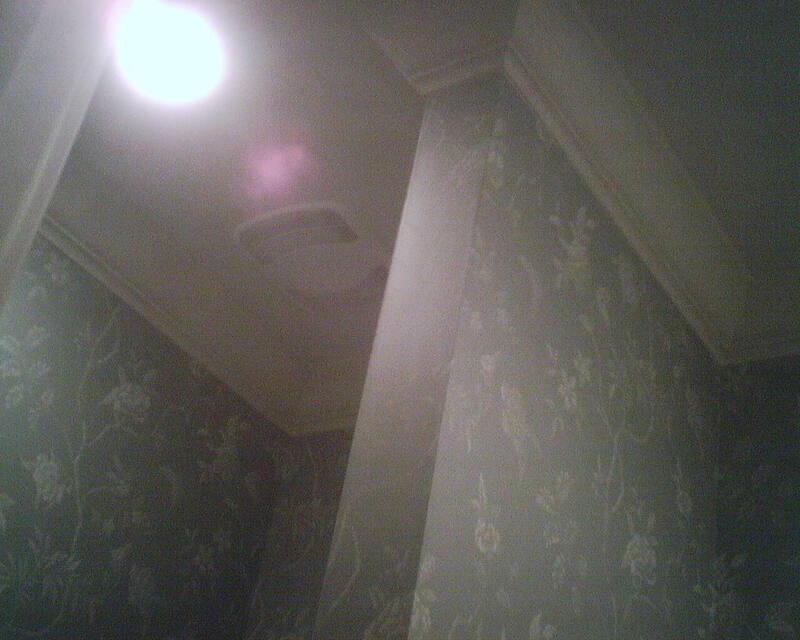 It’s when the wall surface is disturbed (removing old wallpaper) that the mold might be released into the air. This couple lived in England for a while, and adopted British taste in decorating. 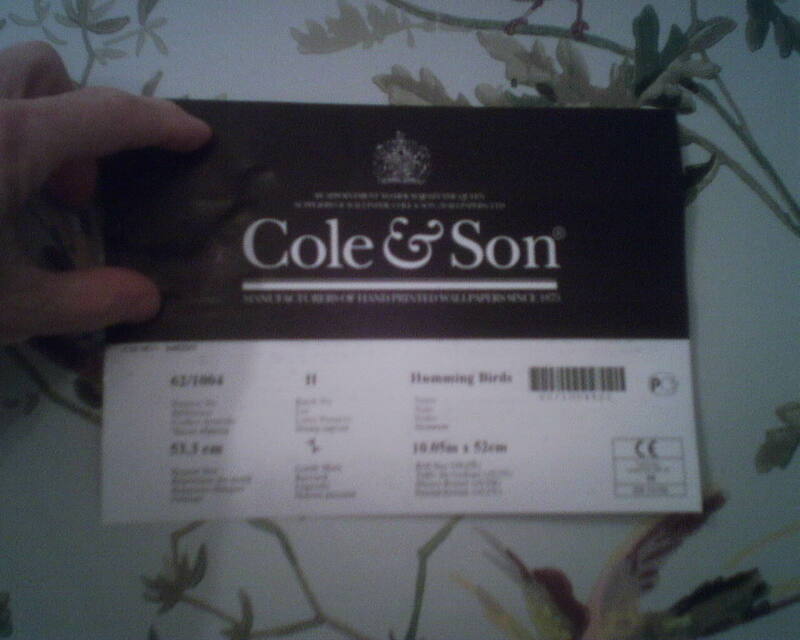 I have papered four rooms for them so far (another is coming up! 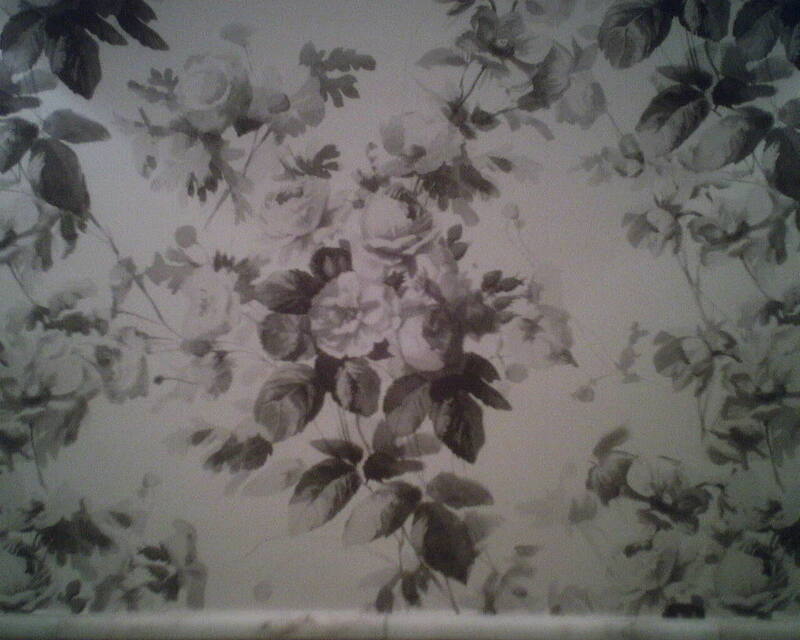 ), and (almost) all have been done in imported British wallpaper, with traditional designs. 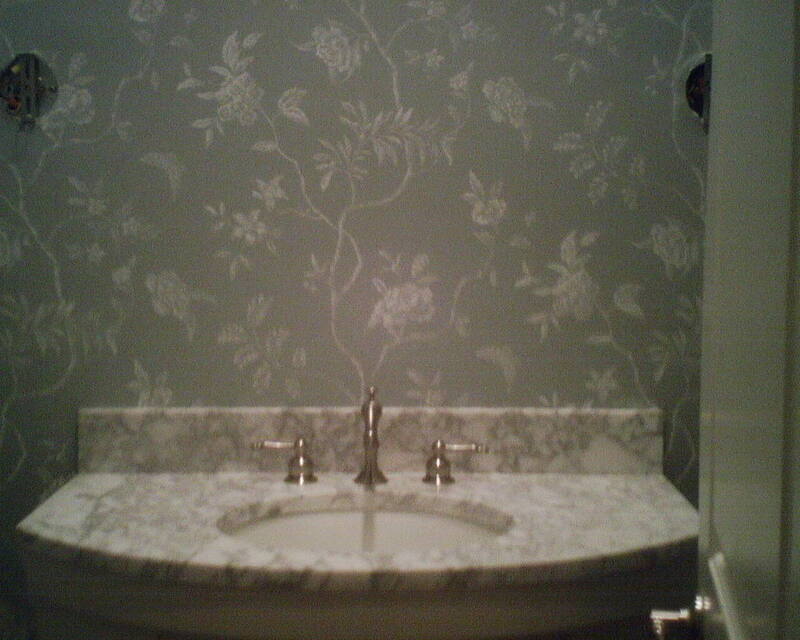 The homeowner loves the traditional Carrera marble in her hall powder room. The marble tile creeps 1/3 of the way up the wall, and the floor has an old-fashioned hexagonal pattern made of grey and darker grey marble tiles. She saw this wallpaper pattern about two years ago and fell in love with it. 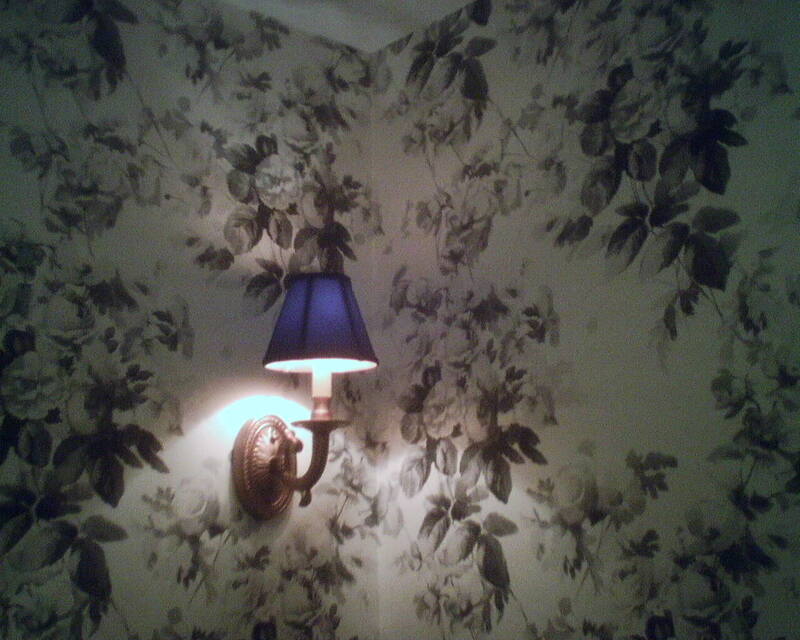 Next, she found some antiqued-brass light sconces in a formal design, that she wanted to use in the powder room. But the previous homeowners had installed a sleek-lined dark wood vanity with a contemporary trough sink with chrome waterfall faucet. She worried that these various disparate elements might not look good in the same bathroom. Well, here you have proof that mixing periods and metals and feels can totally work. 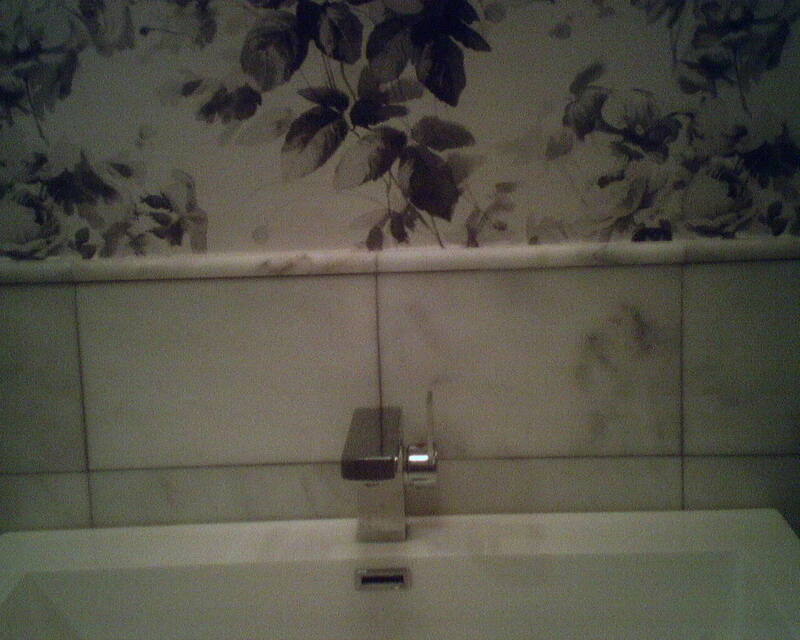 The grey tones in the wallpaper are beautiful against the marble, and they blend well with the chrome faucet. 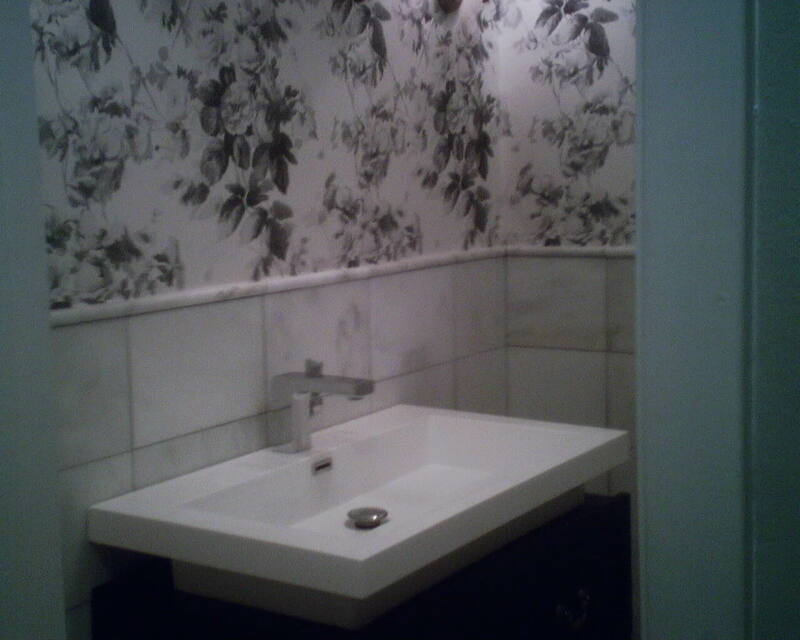 The straight lines of the sink meld nicely with the squares of marble on the walls. The wall sconces fit right in, and the black shades add just enough spark to punch up the room. 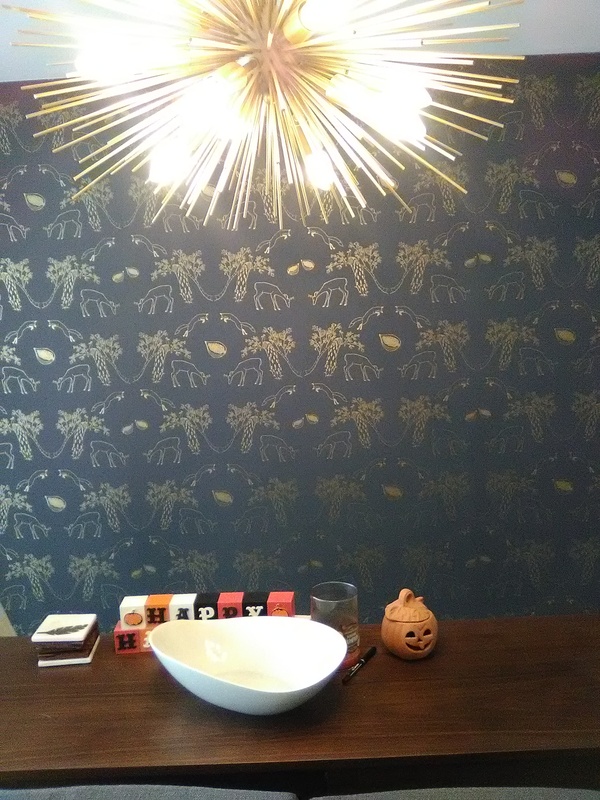 This wallpaper is by House of Hackney, and was printed on the traditional pulp substrate that many British companies are known for. I have hung this pattern a couple of times before, and I have to say, it is one of my all-time favorites. The idea of this pattern dates back to the 1800’s, so it is very historic and classic. It is by a British manufacturer, and one of the homeowners is from England, where they pretty well “wallpaper everything” – and generally in flowery prints – so this bird-and-foliage pattern felt like home to her. She got a good deal on it, too. Bought new, this paper is about $150 a double roll. 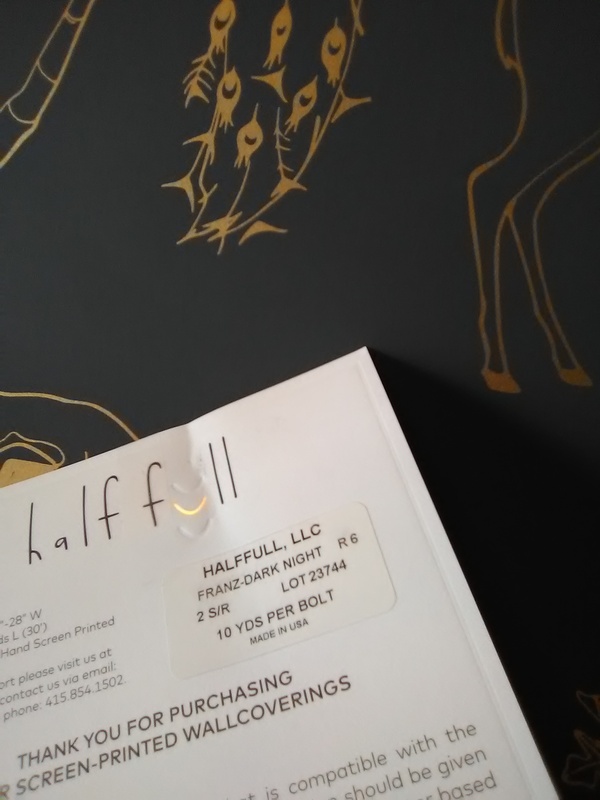 Well, she stumbled upon an unopened bolt at an art store for a steal, and snatched it up. Once I got to the house and measured, though, it was clear that she would need more paper. Once again, she got lucky, by finding two more bolts on ebay for a price way below retail. Unfortunately, the run number of the original paper did not match the run number of the new ebay paper, so we had the potential for color variations between strips. Also, the room really should have had four bolts, not the three we had. But I measured the walls carefully, counted how many strips would be needed, figured where I would be able to fudge on the pattern, and then rolled out the paper to see how we would do. It turned out that this homeowner was, once again, lucky, because the baseboard and crown molding in the room reduced the wall height from 8′ to 7′ – and that was just enough to allow me to get four strips of paper from each bolt, instead of the usual three. There was just enough paper to do the room, and I was able to keep the different runs on separate walls, so there were no eye-jarring color variations between strips. We ended up with, literally, about 2′ of paper left over. Whew! 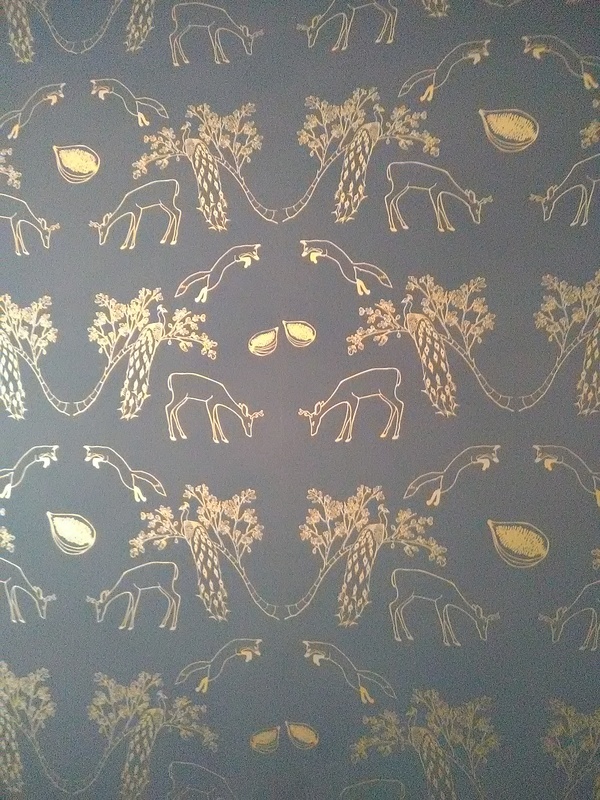 This wallpaper is by Cole & Son, a British company, and is printed on a traditional pulp substrate, different from the non-woven material that they are using these days for much of their paper. Pulp papers do not have a protective coatings so they will look wet if they get splashed by water. They also will not stand up to stains or spills of any kind, and you have to be careful not to touch the paper when reaching for a light switch, or the paper may discolor from oils in your hands. That said, I love the pulps, because the colors and inks and matt finish are unique and beautiful. They lie flat on your wall and don’t have issues with curling at the seams or delaminating like vinyl papers sometimes do. I hung this in the powder room of a 1930’s home in Riverside (near downtown Houston). Most everything in the home (floors, tile, sinks, faucets, windows, doors, doorknobs, stairway’s iron railing, telephone nook, stained glass windows, Art Deco features, on and on) are original to the home, and are in perfect condition. 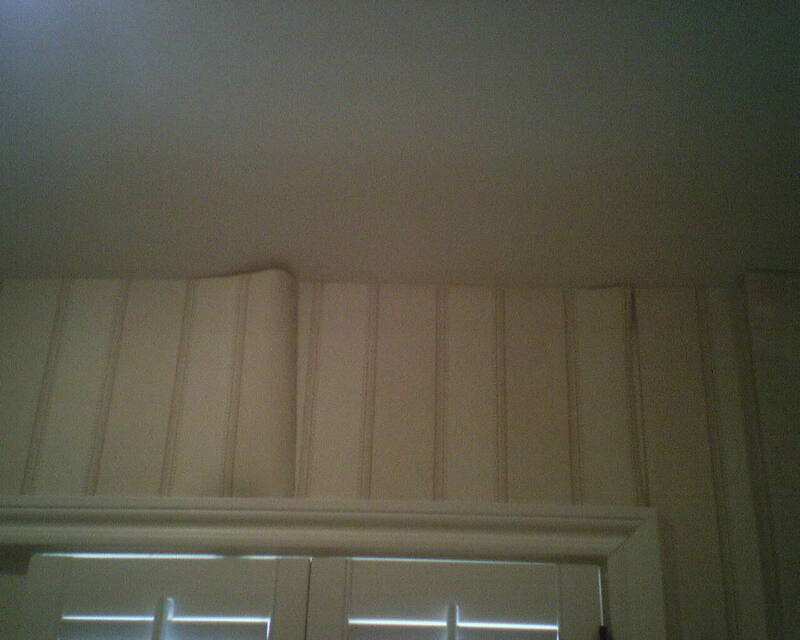 The home even has plaster walls! These elements are reveared and will be preserved by the homeowners. It was a real honor to work there.